Micromax Canvas 2 A110 Features – Is it Really Worth it? You are here: Home / Android / Micromax Canvas 2 A110 Features – Is it Really Worth it? Micromax has finally decided to expand its footprint in the Indian tech market. They have recently rolled out a whole new range of LED TV and they have kept the “Price” factor in their mind. Micromax actually registered a lot of growth last year; they entered the mid-range tablet market in India and almost took it all over. Courtesy to their cheap Micromax Funbook tablet series, this year they have launched LED TVs and I am sure that they’ll be on the top in this segment too. Coming back to the point, Micromax recently rolled out a phone Micromax Canvas 2 A110 in the Indian phone market. 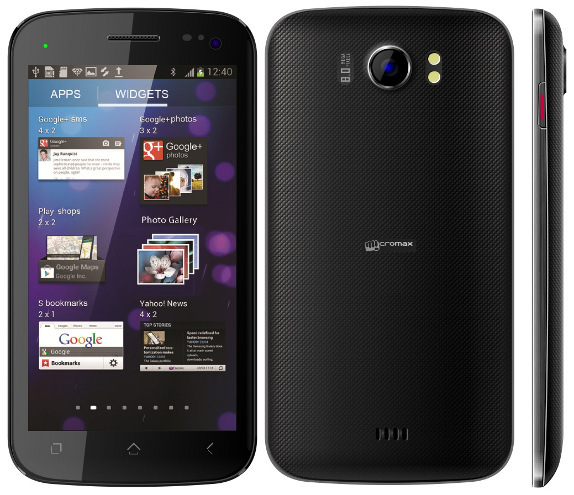 Micromax Canvas 2 A110 is available for just Rs.10,500 (or even cheaper) from online stores. The features of Micromax Canvas 2 A110 are actually that of any other premium class phone like Samsung Galaxy S 3 etc. Here’s a deep review of the Micromax Canvas 2 A110. Following the tradition of phones, Micromax has decided to install Android v4.0.4 (Ice-Cream Sandwich) on Micromax Canvas 2 A110. It’s still not known whether Micromax will make Android v4.1 or Android v4.2 officially available for the Canvas 2 users but even if they don’t, you can root your device and install Custom Jelly Bean ROMs. Micromax Canvas 2 A110 is powered by a powerful Dual-core 1 GHz processor along with the MediaTek MT6577 chipset and PowerVR SGX531 GPU. The dual-core 1GHz processor is actually an add-on to the Canvas 1. Micromax Canvas 1 A100 had a single core 1GHz processor, some people complained about lagging. Micromax team expects no lagging from Micromax Canvas 2 A110. Micromax Canvas 2 A110 is having a mind blowing 8MP primary camera with autofocus, dual-LED flash etc. It has got a 0.3MP (VGA) secondary camera. Canvas 1 had a 5MP primary camera with the same VGA quality secondary camera. Micromax Canvas 2 A110’s camera quality is superb, you can click images of 3264 x 2448 pixels resolution from this phone and that makes this phone as good as any other compact camera. Micromax Canvas 2 A110 has got 4GB of Internal Memory out of which only 2GB is user available. Micromax Canvas 2 A110’s expandable memory is 32GB via microSD card. This phone has got 512MB RAM and may be this is the most disheartening fact. 512 MB RAM isn’t too much for such a gigantic beast; it would have been really good if Micromax had put at least 1GB RAM into it. Micromax Canvas 2 A110 is a dual SIM phone. It supports 2G on GSM 900 / 1800 bands and 3G on HSDPA 2100 bands. Micromax Canvas 2 A110 also supports EDGE, GPRS, Wi-Fi, Bluetooth v3.0, microUSB v2.0. It must be noted here that Micromax Canvas 2 A110 doesn’t support NFC. Micromax Canvas 2 A110 has got 147 x 76.5 x 9.7 mm dimensions and this makes this phone almost 2mm sleeker than Canvas 1. Micromax Canvas 2 A110 has got IPS LCD capacitive touchscreen with multitouch support. Screen resolution of Micromax Canvas 2 A110 is 480 x 854 pixels with 196ppi pixel density. It has got 5.0 inches screen and this brings this phone into the category of phablets (Tablet + Phone). If you are searching for something that is more like a tablet but a bit smaller than phablets are something made for you! If you have got enough money to buy this phone then believe me, you should not wait! Just go to the nearest Micromax store or logon to any Shopping site like ShopClues, Flipkart etc. and buy this phone. This phone has got a hell lot of features and this phone comes under a really cheap price. The size of this phone makes this phone even look good. This phone has got looks, features and this phone is cheap!